It’s a bank holiday weekend, so we’ve got a bumper round of gigs to tell you about this week, extending all the way out to Monday. On Thursday night Juice FM return to the Haunt for a series of gigs showcasing local bands that they’re calling IntroJuice-ing. On the first of these DrDr launch their new EP with support from Dirty Damn Humans and Vaude Villains. 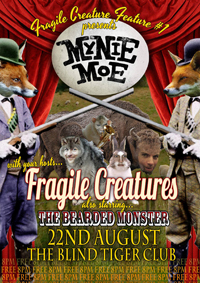 It’s also the first night of Fragile Creatures residency at The Blind Tiger, and they’re joined by Mynie Moe. As well as that, TigerBiteFever launch their Love Is Strange EP at Latest Music Bar. There’s another two launches on Friday night. Speak Galactic and P For Persia launch their split 12” at the Green Door Store, and yourgardenday launch their Flat Stream EP at St Andrews Church. Late night on saturday at Sticky Mikes, The Repeat Prescriptions play their last show for a while, supported by The Space Agency. At The Edge of the Sea is a festival curated by The Wedding Present which has been running at the Concorde over the August Bank Holiday Weekend for a good few years now. This year The Wedding Present play George Best on Saturday and The Hit Parade A-sides on Sunday. Support comes from his 90s pop incarnation Cinerama playing the two sides of their debut Va Va Voom across both nights, and a whole host of supports including Brightonians Dog In The Snow, Pete Fij & Terry Bickers and Monster Bobby. Finally, if you’re still standing come Monday night, get down to the Green Door Store where Kill Moon headline, with Puppet Kings, The Hunger Pact and The Downing Street Years also on the bill. This entry was posted in Uncategorized and tagged "Vaude Villains", At The Edge of the Sea, Blind Tiger, Cinerama, Concorde, Dog in the Snow, DrDr, Fragile Creatures, Green Door Store, Haunt, IntroJuice-ing, Juice FM, Kill Moon, Latest Music Bar, Monster Bobby, Mynie Moe, P For Persia, Pete Fij & Terry Bickers, Puppet Kings, Repeat Prescriptions, Space Agency, Speak Galactic, St Andrews Church, Sticky Mikes, The Downing Street Years, The Hunger Pact, TigerBiteFever, Wedding Present, yourgardenday by brightonmusicblog. Bookmark the permalink.